alaTest has collected and analyzed 454 reviews of TomTom VIA 62. The average rating for this product is 4.3/5, compared to an average rating of 4.0/5 for other GPS for all reviews. Reviews about the maps and price are overall positive. The size and screen are also mentioned favorably, but there are some negative comments about the route planning. Opinions about the durability and performance are different. We analyzed user and expert ratings, product age and more factors. 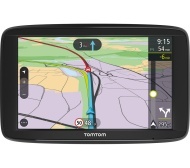 Compared to other GPS the TomTom VIA 62 is awarded an overall alaScore™ of 96/100 = Excellent quality. The six-inch TomTom Via 62 has plenty of useful sat nav features - including traffic data via your smartphone and speed camera alerts. So is it up to speed with other sat navs we've tested? We sent it to our test lab to find out. The Tom Tom Via 62 is . I like the clear screen and ease of use. I don't like that you have to stick it on your windscreen. I would rather have it on my dash.